A clinically proven way to naturally reduce facial wrinkles. Have you spent too much time and money on treatment products that didn’t seem to help? Now you can fight the signs of aging with a complete anti-aging product. Welcome to the Future of Anti-Ageing Skin Care. It’s time to leave undefined skin in the past and enjoy firmer, more youthful looking skin today and tomorrow. Tru Face® Essence Ultra helps restore youthful facial firmness, promotes cellular energy production and helps prevent future signs of aging. Combined with a powerful antioxidant network, including coenzyme Q10 and TeGreen 97®, this facial firming serum rejuvenates and protects skin elasticity. Featuring Ethocyn®, an anti-ageing ingredient, clinically proved to improve skin’s elastin content, the key component to firm skin. A UCLA controlled study showed that the clinical doses of “Ethocyn” in this patented product, exclusive to Nu Skin returned the Elastin level in the skin to that of an 18 to 24 year old! Participants in the study ranged from 44 -77 years old and 99% had an 88% increase. Core biopsies were performed to clinically confirm the elastin levels before and after 60 days of use. • Promotes skin firmness and elasticity and fights current signs of ageing with Ethocyn®, an ingredient clinically proven to improve skin elastin content. • Helps prevent degradation of elastin with elastase inhibitors. • Contains green tea extract, CoQ10 and colourless carotenoids, a complete protective antioxidant network that helps minimize future signs of ageing by protecting against skin-ageing free radicals. • Helps contour and firm the skin for a more youthful appearance. • Defines skin around the eyes, neck, chin, jawline, décolleté and hands. Apply Tru Face™ Essence Ultra to clean, dry skin following your toning step. If you are using other Tru Face™ products, apply Tru Face™ Essence Ultra after applying the other treatment products. 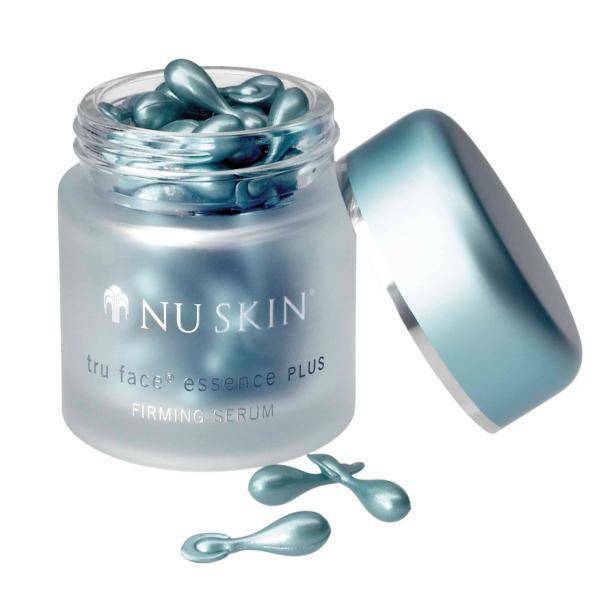 To apply Tru Face™ Essence Ultra, twist open one capsule per use. Gently squeeze two or three drops directly onto the areas of concern and then apply the remaining product to the entire face, neck, décolleté and hands. A thin coat of product is all that is required to reach the maximum benefits. Since the skin activity of Ethocyn® is depleted 8 to 10 hours after application, Tru Face™ Essence Ultra should be applied twice per day. Include it as the final treatment step in your daily regimen prior to moisturising. • Ethocyn® – anti-ageing ingredient that has been clinically proven to improve the skin’s elastin content, the key component of firm skin. • Antioxidants – compounds that neutralise free radicals or prevent free radical-initiated chemical reactions. • Green tea extract (Tēgreen 97® ) – an antioxidant that helps protect the skin from oxidising free radical damage. • CoQ10 – a powerful antioxidant that promotes cellular energy production and functions best within an antioxidant network. • Colourless Carotenoids – unique antioxidants produced from algae that help protect the skin from environmental hazards.